In this document you can find all the technical information you will need while using our system. There are eight main sections and each one contains information about a different part of our system. to make your learning as easy as possible. the Server, The Online User Interface and the Clients. The server provides technical background to our system. It also provides a communication channel between the other components. See more about: Server high level overview. The User interface provides all the functions and settings a user needs to do. You can manage your screens, contents, templates etc. You can also manage your users, clients and datasources. See more about: User Interface. We currently have 2 types of clients, Android and Windows. It can run on all kind of android devices. from the interactive elements in your content. It can run on Windows 10 devices. See more about: Android Client. See more about: Windows Client. We are currently working on a new component called Sensors. and the contents can react to it. For example: distance measuring, motion detection, laser relays. See more about: System components. We are constantly working on new ideas and futures. 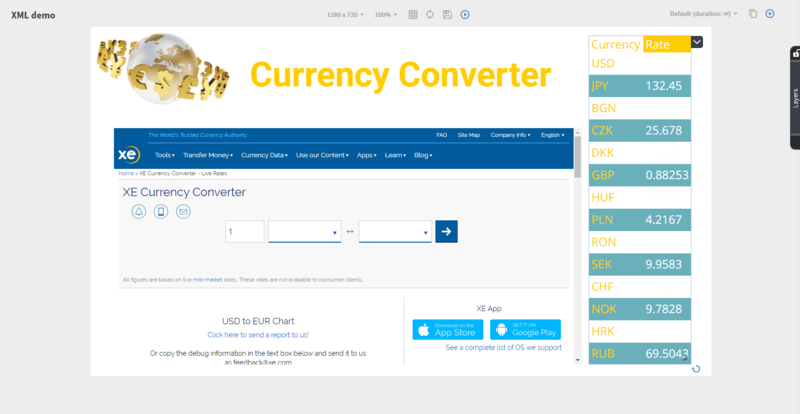 We are capable of displaying contents on android and on windows devices. We are also working on a LG Tv application. See more about: Android clients. See more about: Windows clients. With our Online Editor Interface you can manage your system and create professional contents easily. See more about: Content editor. may not work as intended. See more about: Supported browsers. The server provides a technical background to our system. See more about: High level over view. See more about: Server prerequisites. See more about: Android prerequisites. See more about: Windows prerequisites. In the 1.1 version of our system we have done over six hundred issues. This document summarizes the most important ones. The 1.2 version is the current version of our system. We have done over three hundred issues. The 1.2.1 version is the version that we are currently developing. We have over a hundred issues planned. In the 1.3 version of our system we already have two hundred issues to do. An on-premise install also has the similar prereqs as the server. First you need to have a server. It can be also installed on a Windows server and even with MS SQL. If it is needed we use only 8080 and 8181 ports for the communication, WebSockets. 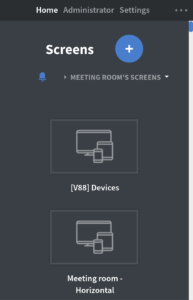 The server has to be able to reach the devices. If the server can not reach out to the internet, you can only have Lifetime devices. When you login to our Editor interface for the first time the first thing that you are going to see is the Summary page. The first thing that you have to do is to create a client in the client's menu. After that you will be able to navigate to the Home Screen. See more about the: Home screen. 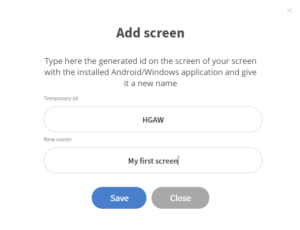 The second thing that you have to do is to download our Android or Windows client application and install it to a device. See more about : installation on android. See more about : installation on Windows. The next thing is to register the new device into the Editor interface. See more about: Registration of a new device. 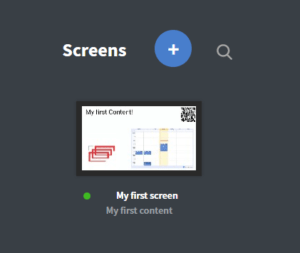 Now you need something to display on your device, you can create your own content in the editor and then assign it to a screen. See more about: How to use our editor. You can also create a content template and use that to create other contents. See more about: Content templates. Check out our Knowledge Base if you want to know more about our interface. Or you can print all of the articles of the knowledge base from here. If you have any question, feel free to ask about it in our Q&A section. it consists of new futures and technical and visual updates. The updates comes basicly in a .var file that you can install to your system. 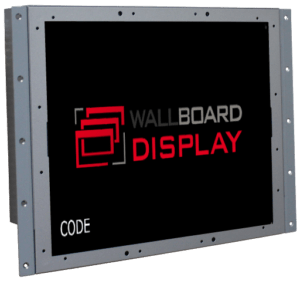 There is a possibility to install your server white labeled, so you can sell Wallboard as your own product, under your product's name. If you want to get more information about our server prerequisites, click here. A favicon (.ico, 48x48px), which will be appeared next to the name of your website on the browser's tab. A logo (.jpg, 77x77px), which will replace our logos. Backgrounds (.jpg, any size, we suggest the most common sizes/aspect ratios, for example 1920x1080), you want to have in the background of the login screen. URL-s for a tutorial video, helps. If you don't want the Help button to point to our knowledge base. the e-mail address of the 'from e-mail'. This e-mail will be the displayed as the sender. An error message that will be displayed in case the server goes down for some reasons. A launcher icon (512x512px, transparent background). An application ID for the Google Store. The application name which will be displayed in the Google Store. A logo (400x90px, transparent background) to be displayed on the login screen of the android client. 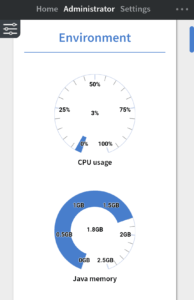 In the System Dashboard Menu you can see statistics of your entire system. Here you can see information about the Environment, such as: the CPU usage, the memory, the system HDD, and the License period. Here you can see information about your Assigned Licenses such as the pool, the free, the monthly, the yearly and the lifetime devices. Here you can see information about your online licenses. Here you can see information about the uptime of your devices. Here you can see the usages of your contents, customers, dead datasources, unassigned devices. You can change the role of your users in the Administrator / User menu. Assign and unassign contents to screens. 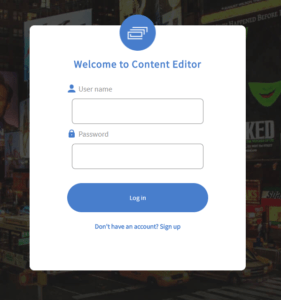 Create and edit unassigned contents. Add and manage clients, users, messages. You can access your User Settings by clicking your username on the top left corner. In the User Settings you can change your displayed name. You can change your password by typing in your old password then the new password twice. You can also change the language of the website, and set your own user icon here. It is made to guarantee for our customers custom business logistics. You can request a content by clicking the plus button. You can type the details of your content into the message field. You can set the name of your content and you can also select your screen group. 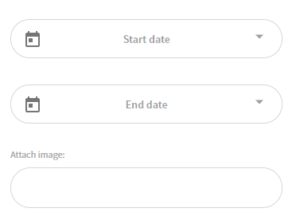 You can set the starting and the ending date of your content creation. You can also attach images to your request. 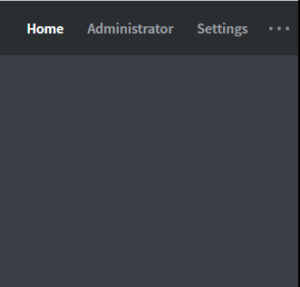 In the Administrator Menu you can manage your system. Your Environment, Assigned / Online Licenses, the Uptime of Devices and the Usages. 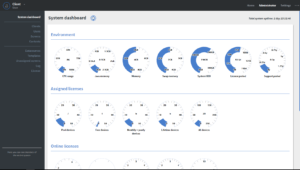 See more about: System Dashboard. In the Clients Menu you can manage your clients. You can add and remove your clients from your system. the expiration date, the Analytics ID and a comment to your clients. In the Users Menu you can manage your users, add new super administrators and restrict them. You can add and remove users from your system. You can set the name, the e-mail, the role, the comment and the password of your users. 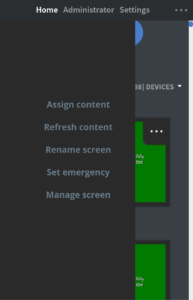 In the Screens Menu you can manage all the assigned screens in your system. the Emergency status, the client name, the assign and the installation date and the latest activity. 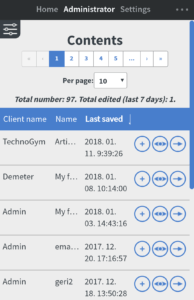 download CSV, preview screen and move screen to a client. In the Contents Menu you can manage all the contents of your clients. the last saved by, the display time and the comment of your contents. You can also remove and preview contents, create templates and move contents to other clients. In the Datasources Menu you can manage your data sources and connections. you can refresh time and see the comment of your Datasources. You can also randomize, remove, preview, edit and refresh your datasource. If you insert google sheet please make sure that the first row contains the headers, starting from A1! 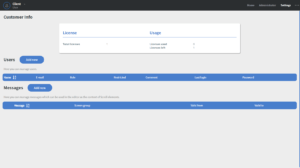 In the Templates Menu you can create and manage your templates. You can also remove, edit, duplicate, export and import your templates. In the Unassigned Screens Menu you can manage your registered, but not yet assigned screens. and the type of OS of your unassigned screens. In the Log Menu you can manage your logs. Here you can see the Time and the Message of your Log. You can also filter the search by the date of the logs. In the License Menu you can see your active license details. the screen licenses, the network binding, and about the license status. Please note that we will not make server backups for your system. Every customer or reseller should make their server backup for themselves. However, we are highly recommend to have backups in case of any server failure. For our recommendation of infrastructure design (which involves backup server), please click here. To make backups you only need to copy the storage folder where we store the data and dump the MySQL database. You can even copy the whole server structure if you want to. Storage: usually it is located in the /home/wallboard-storage. This is where we store the Customers' contents, files, preview images of its devices. 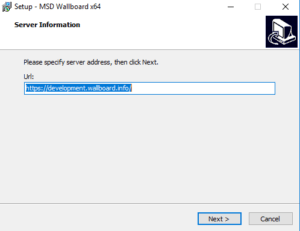 MySQL database: you have to dump the whole database named wallboard. We have Android and Windows clients (32 bit and 64 bit). Also we are working on an LG-Client. you can access them by clicking the three dots up in the top-right corner. The LOG file is a file that records events that occur with the Client. 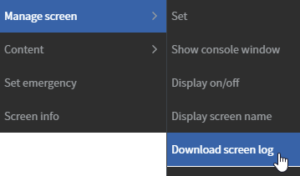 Right click on the device, and select the download screen log option. When you install the application on a device you will see a four digit code in the bottom left corner of the screen. You have to login to the editor interface and add a screen: enter it's four digit code and name it as you want. When it is done, you will see the new name in the corner (you can hide it from the right click menu on the device). 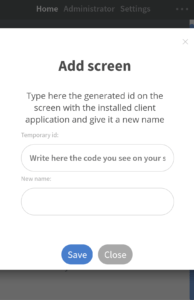 You can add screens by writing in the code that you see on the screen of your device. You can also name your screen here. You can assign your content by dragging over to your screen. The green circle indicates that your screen is active. By right clicking on your screen you can access further settings. You can Assign and Unassign content here. You can quick load pages , and reload the content here. You can move your screen into a group, or remove and rename your screen. that will be loaded until you turn the setting off. You can also check information about your screen. 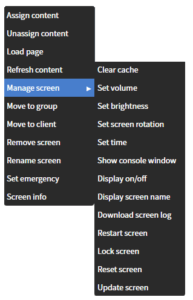 Under Manage screen option you can access more settings. You can clear the cache, set the volume, the brightness, the screen rotation, and the time of your screen. and turn on and off the whole display. 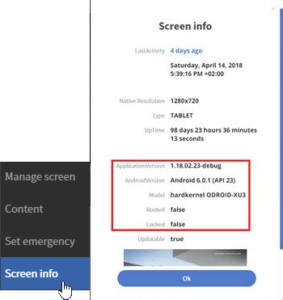 You can download your screen log. You can also restart, lock, reset, and update your screen here. You can use our online interface on your mobile devices as well. As a Super Administrator you have acces nearly to everything on our mobile interface. 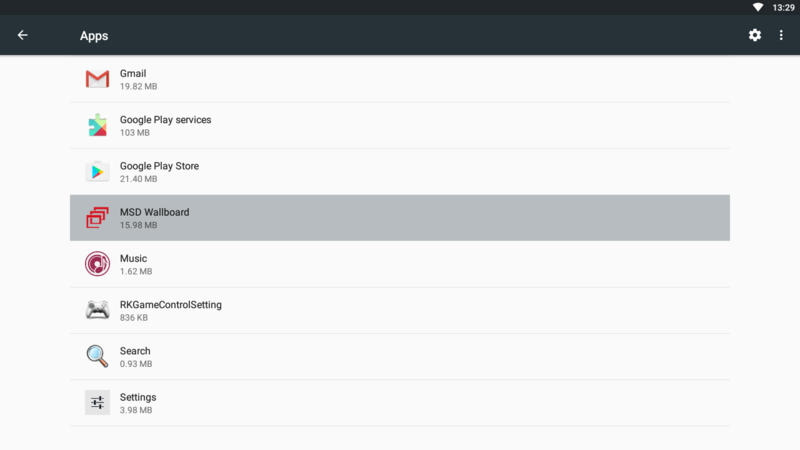 You can Add and remove screens, manage and assign contents, change clients. You can Add remove and Manage screens on the mobile version too. You can Manage your Screen groups, Screens and your contents. the full sized version of the editor. You can also manage your Super Administartor functions here. On our Q&A site you can ask questions, report issues or ask for help. We will answer them, and help if needed. When you create a question you can give a short title to your question and a more detailed description. You can create public and private questions. Only you and the administrators will see the private questions. You can set the category that fits your question the most. 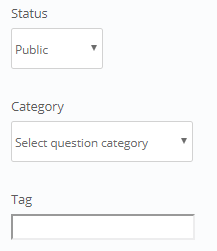 You can also set a tag to the question to help others find it. You can search for a question by its status, category, tag or use the search bar to find one by it's title. When a question is created it will have Open status icon. 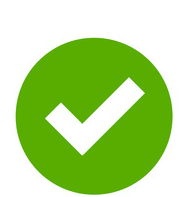 When a question or issue is solved it will have the Resolved status icon. When we can't give answers to your question or solve a problem it will have a Closed status icon. You can vote to answers if you find them more helpful than others. when somebody answers or comments to it. it will be indicated, to help you find the right answer to the question. See more about: Home Screen. See more about: Administrator Screen. The server communicates with the clients trough WebSocet communication. The clients, the sensors and the online editor interface communicates with the server trough Rest API communication. Our windows client can be useful in multiple situations. 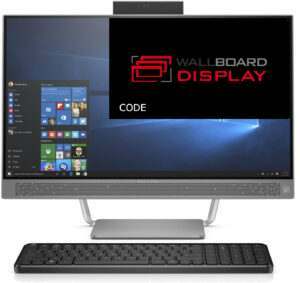 The main benefit is that you can display to multiple screens from one Pc (with a stronger graphics card). wich can be useful in public places (such as in a hotel). You can mount your screens on the wall or use a simple stand for it. If you want to display data in your content, which can be altered any time, but you do not want to edit your content each time the data changes, you can use XML data binding. 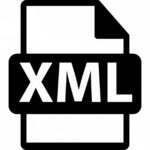 You can use your own XML file or a simple Google Spreadsheet to create xml connection. Just create a spreadsheet like this. Note that only users with SuperAdmin role can acces this menu! Choose your datasource a name, which will be displayed in the Datapicker. Select the client whom contents you want your datasource to use on. Add the XML file's URL or the URL that we created in the first step. You can use data binding on elements where there is an option for Datapicker. Also, all the dynamic charts can only be used with data binding. Meter, List, Pie, Bar, Column, Line, Area, Pyramid, Gauge. For the example, I chose the List Dynamic chart element. 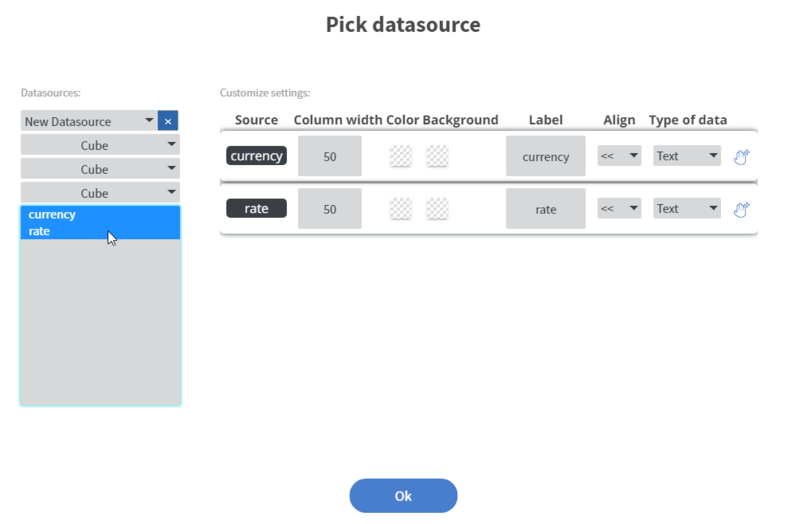 In the data picker, select your datasource. alignment and the type of data, which can be Text or Image. The columns can be dragged up and down. This way you can set the order the columns will be shown. Now, you can start formatting your content to your own liking. The decoder is required, the encoder is recommended. • Windows: The same can be played, but in Windows you can play even more formats since windows have had much more codecs. We are Using MySQL database to store all kind of data. We are also using a file system to store images, template images, videos, sound files, templates, contents and the preview picture of contents. 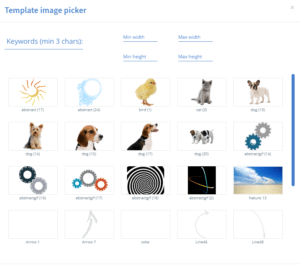 You can also upload your own template images into your system. See more about: Template images. There are three components that needs acces to a netwok. The clients needs network connection to communicate with the Server. 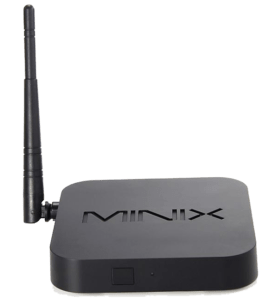 Clients can connect with WIFI or with Ethernet cable, we suggest the Cabeled connection beacuse it is more reliable and faster. We suggest having the server in the same country as the clients are so they can communicate smootly. The sensors can connect only to WIFI. We suggest having a separated network for them, it can be an invisible network as well. Our android client's biggest benefit is that it is compact and universal. It is also cheap and can work with any regular screens. There are also screen types that you can mount inside of furniture, or up on to the wall. 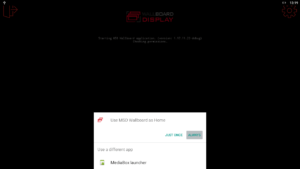 Our Android client displays the content on an Android 4.4+ device. For being able to load the content without internet connection our client application stores all the components of a content on the device storage and supplies the embedded browser locally. This also reduce the network traffic significantly: images or videos are downloaded to the device only once, so when you play a content that includes large video it will download the video only one time, and next time the video will be played from the local storage. Since the Android system has supported the video auto play from the version 4.4, our application prerequisite is that Android version. Our client application can run on non-rooted devices too, but we prefer to run on a rooted device. 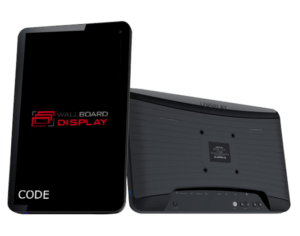 In that case we can do many things that are not supported on a non-rooted device: silent updating in the background, sync the system time to the server clock, or for example disable those applications that are not needed for a signage device (gmail, calendar, kodi…). Since our application communicates with our server it is mandatory to enable wifi or Ethernet connection for communication. Download our latest application from your editor interface, from the download menu in the right upper corner of the editor. Enable wifi or Ethernet connection on the device. 2. Copy the .apk file to a pen drive and install it on the device (you will have to enable the installation from unknown sources setting). 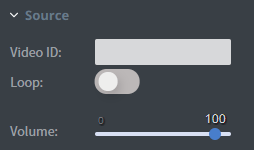 Also, it is also good to enable the USB debugging in the settings, that will allow you to connect to the device on USB if something goes wrong. 3. Start our client application and set up the server address if that needs to be changed, also the device type. You can choose the immediate lock down if you already know that our application works fine on that device type. 3. (optional) Set our applicition to be your default home applicition on your device. This step is necessary if you want our client to start after reboot of the device. 5. With that code you need to register the device under your account on the Editor interface. 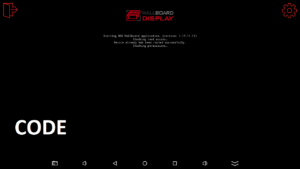 Select Screen under the (+) menu. 6. 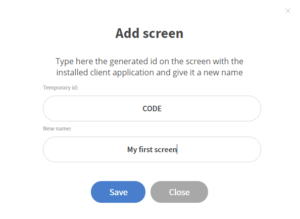 Type the code into the pop up Temporary ID input and give your screen a name. and sets the boot animation. Locking down the device need to be done only once, it will take several minutes, and if it was successful it will restart the device and you will see our boot animation when the device boots up. you can control the device on the editor interface with right clicking on it. Professional devices: these devices are for 24/7 use, include built in battery, and can be configured to automatically switch on and off. AOpen is one of these producers. We always recommend our partners to test the devices before they order a large quantity. Rooting device is always recommended. Our application with root privileges can access system functions like syncing time, restarting device or updating application in silent mode. 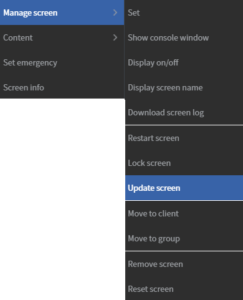 You can update a screen or screen groups in the right-click menu. Go under the manage screen sub-menu where you can find the Update screen(s) feature. This feature will force the device(s) to download the update and install it. the changes will take effect. However, if the device is offline it will not be able to download updates, and you can't force update until it reconnects to the network. With the text element you can print your own text to the canvas. See more about: Text element. With the image element you can add your own pictures to your content. See more about: Image element. With the shape element you can put different types of shapes to your canvas. See more about: Shape element. With the Clock element you can add a digital or an analog clock to your content. See more about: Clock element. With the custom element you can display a website or html code. See more about: Custom element. With the Scroll element you can display text in many different ways. See more about: Scroll element. See more about: Weather element. With the gallery element you can add an image gallery to your content. See more about: Gallery element. With the Carousel Element you can add an image gallery to your content. See more about: Carousel element. With the Video Element you can add your own video to your content. See more about: Video element. With the videos element you can display multiple videos in your content. See more about: Videos element. With the Stream Element you can broadcast your streams in your content. See more about: Stream element. With the youtube element you can play a youtube video in your content. See more about: Youtube element. 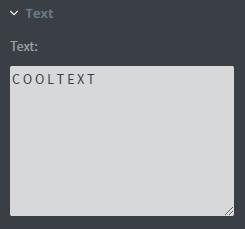 With the the cooltext element you can add animated text to your content. See more about: Cooltext element. With the pieces element you can add animated images to your content. See more about: Pieces element. 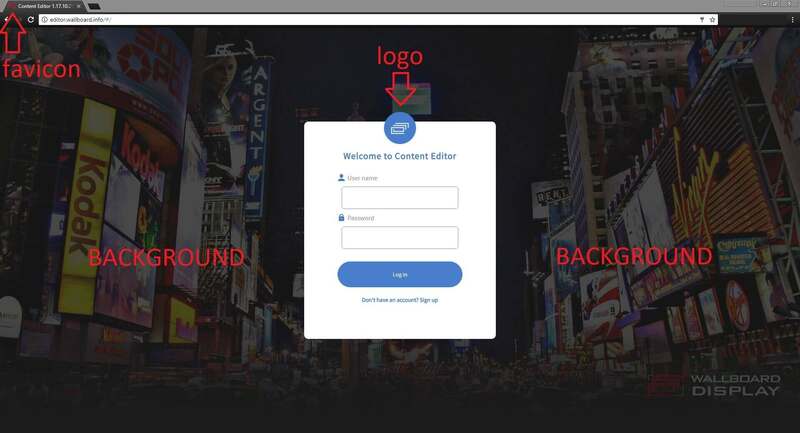 With the Content Element you can display another content in your content. See more about: Content element. With the Contents Element you can display multiple contents in your main content. See more about: Contents element. and add it to your content. See more about: QR Code element. With the Google Doc Element you can display your google docs in your content. See more about: Google Document. With the calendar element you can display your calendar in your content. See more about: Google Calendar. With the meter element you can display values from a datasource with a meter. See more about: Meter element. With the list element you can display your datasources in your content in list format. See more about: List element. With the pie element you can display values from a datasource with a pie chart. See more about: Pie element. 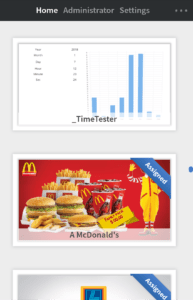 With the Bar element you can make a chart of your datasource. See more about: Bar element. With the Column element you can make a chart of your datasource. See more about: Column element. With the Line element you can make a chart of your datasource. See more about: Line element. With the Area element you can make a chart of your datasource. See more about: Area element. With the Pyramid element you can make a chart of your datasource. See more about: Pyramid element. See more about: Gauge element. 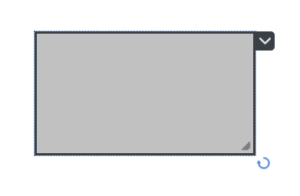 With the Check Box Element you can make interactive check boxes. See more about: Checkbox element. 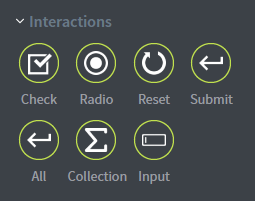 With the Radio Element you can make interactive Radio buttons. See more about: Radio element. to basic values in the elements button group. See more about: Reset element. interactive element and send it to an e-mail address. See more about: Submit element. elements and send them to an e-mail address. See more about: All element. With the Collection Element you can display the collected data from your button group. See more about: Collection element. With the Input Element you can create an interactive field to collect data. See more about: Input element. With the facebook element you can display facebook social pages in your content. See more about: Facebook element. With the twitter element you can display twitter social pages in your content. See more about: Twitter element. Your Master page will be the content in the background. You can set the Master page in the editor under the Page properties. You can turn this function on in the page properties menu. Here you can see the preview of a content that is not streched. The content keeps it's original width and lenght. Here you can see a content that is streched out. The content fills in the whole screen. 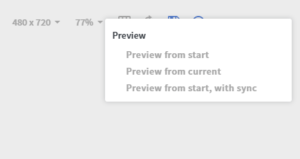 Different types of preview modes in browsers. (the default page) of your content. (the one that you have opened up in the editor). (the default page) of your content, with synchronisation. With the interaction elements you can create your own forms inside of contents. First you have to place the Interactive Elements on to the canvas. You can choose from 7 Interactive Elements: Checkbox, Radio button, Reset, Submit, Submit all, Collection, Input. Then you have to name your Button Group. their Button Group name has to be the same. to be checked or unchecked. and also another one when it is not selected. You can name your element in the Event Name field, and later that will be displayed. You can set the Checked and the Unchecked Value of your Interactive Elements. depending on if it is selected or not. If you want to save and use the collected data you need to use a Submit or a All element. Then the data will be saved down to your database. You can also send this data with e-mail, you need to set a Receiver e-mail address for that. I have created a content with two check boxes and a collection element. All of the three elements has the same button group set, so the can interact with each other. Check e.value: "1" and an Unchecked e.value: "0"
Check e.value: "checked" and an Unchecked e.value: "unchecked"
the unchecked value of the Box1, and the checked value of the Box2. When you are ready with a content you can easily share it with your colleagues, partners, customers. Under Page menu you can manage the background color. You can set the Background type as an Image and color or as a Video. You can select your background file in the Background menu. 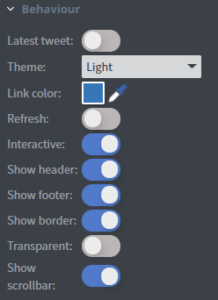 You can also set a background color in the Bg color menu. Page length means that how long each page will be displayed in your content. You have to set the length of a page to be bigger than the enter and leave animation of the page together. You can set the length of a page in the pages menu. The slide transition set the animation type between pages. You can set the animation type in Page / Dynamic Pages Menu. from 0 to a 100 within the animation time. With the slide animations the page will slide in from different angles. You can also set the duration of the animations. In animation menu you can animate your element. You can either set an enter animation or an exit animation to your element. it means that the animation will start after the period of time you adjusted. You can also set a repeat animation to your element, and set delay to this one either. This will be played over and over again. 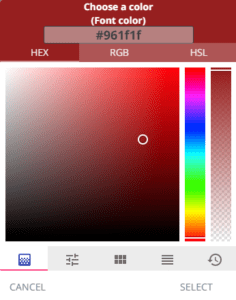 In the color selector window you can select the color you want in many different ways. or you can use the color pickers. The first color picker tool is a regular color picker you can select the color by moving the circle. 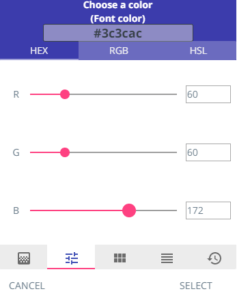 With the next color picker tool you can modify your color by changing the amount of the 3 different colors. With the third color picker tool you can select from the basic colors. 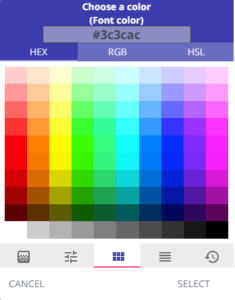 With the last color picker tool you can select from the shades of the colors. 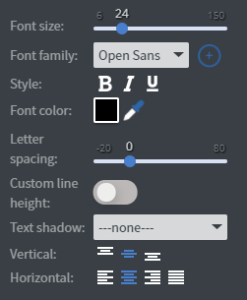 In the font menu you can set different font settings. 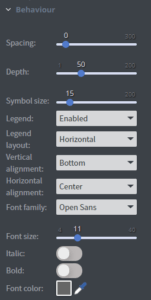 You can change the font size from 6 to 150. You can also change the font family or make your text bold, italic, or underlined. The font color can be changed too, about that see more here: Using colors. You can set the letter spacing from -20 to 80, or add shadow to your text. You can also set the vertical and horizontal placement of your text. With the jump function you can navigate between your pages. In the jump function you can change the type of animation to jump popup or navigate. a new page will be loaded in. the new page will pop up like a window. the selected screen's content will be loaded in. With the Mask function you can cut a shape out of your element. then you have to select a picture in PNG format. Here you can see a box type Shape Element. 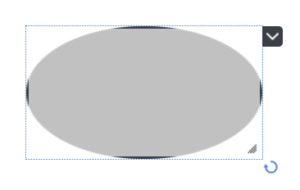 Then I select this circle.png image to mask over my element. And here you can see the result. In the Size&Position menu you can set the width, the height and the placement of your element. You can set the width and the height of your element to: - 1/1 (total) -1/2 (half) -1/4(quarter) of the content's width or height. You can also position your element horizontally and vertically, very easily with the three options given. 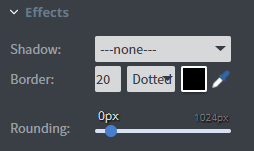 In the Other Size And Position Menu you can set the size and the position of your element by pixels. You can also rotate your element by degrees here. 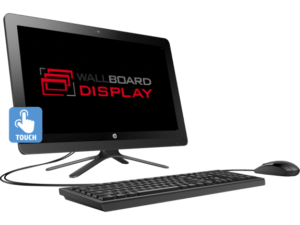 In multi-display setups the ability to keep dynamic content playback synchronised is essential. The start time of a content loop playback depends on many factors on each screen, when did you turn the screen on, was it online when the content was updated, how fast is your network, when did it restart after an update etc, making it necessary to let the displayer know of timestamps when the start of a content is appropriate in time and identical with every screen in the system. In our current implementation the displayer can only keep one page rendered in one browser window at once. Because of technical limitations swapping pages can never be an instant 0 second task and depending on your hardware and content complexity the time required to render the next page can be very different on each screen, which over a large period of time can add up into a significant difference in the progress of the displayed content, therefore synchronising only start time of the contents is insufficient and unreliable. The base of synchronisation is setting the local time of the screens as precisely as possible, and keeping it updated over long time. Assuming an accurate clock in the calculation we can define an exact time position in the loop as the quotient of the absolute time, and the full length of the content loop. For example, if you have a 1 hour long content, with 60 pages, each set for 1 minute duration, we know that each loop ends, and the content restarts exactly at the beginning of each hour. Let's say current time is 1:37 PM 30 seconds, then the displayer should show the 38th page, swap to the 39th page 30 seconds later and so on. Content pages can have many widgets which can also contain material which repeats, these are: video, video gallery, weather, image gallery, carousel, contents widget (embedded sequence of contents), and repeating animation on any widget. Therefore we distinguish two groups of elements, contents and widgets. When the mentioned two groups overlap, synced contents contain widgets which can sync on their own, then only one of them should sync, because different loop lengths can cause contents to position differently from their defined order. For example you have a page containing an image gallery widget with 5 images, each image is having 5 seconds duration. If you use that page as a master page for another content, the page will not swap to another page at all, just statically display indefinitely, therefore the gallery inside should sync on it's own to change it's images exactly in every 5 seconds, regardless of when the whole content was started. If you put that page in a synced content loop, giving the page the exact 25 seconds to rotate through the whole gallery inside it, then if you would also allow the gallery to sync, it might jump to any of the images, and might display that image for less than 5 seconds, depending on the absolute time. Ideally though you probably want it to play from the first image you defined, for precisely 5 seconds each. As one exception, if the length of a page inside the loop is greater than 5 minutes, the sync of the widgets will not be prevented by the above rule. In the editor menu there is an option to enable sync for contents under the Page category, and for each applicable widget listed above, under their respective properties menu, which are turned off by default. When you open a preview from the editor in your browser, there are 3 options, only the third allowing sync. The other two opens an url which has the '&noSync=true' part in it, that disables sync. 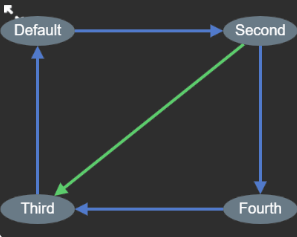 The given content must contain a loop, which means any sequence of pages connected in a row, where the last page is connected to any of the pages previously displayed in that row. In a sequence stopping at a given point, there is no point in skipping pages which will not be displayed at all. Currently any page change that violates the defined order of pages in the loop, also disables the page sync, which can come from datasource, user interaction, or page jump set at the end of a video widget. 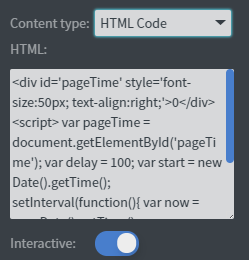 When a page is started by schedule in the current content, the loop swaps are paused, and the sync becomes disabled, and will be re-enabled when the scheduled page(s) end. If any of the above conditions are not met, the sync will be disabled for the given element. When the sync is active, the loop of pages defined in playlist editor will be interpreted as an endless series of intervals, and any given point in time will be contained by exactly one of these intervals, determining which page should be running. When first loading a content, it always starts with the Default page, and it will keep the exact order defined, so synchronization is achieved through only modifying the duration of the pages. If the first page's interval is significantly late behind the determined one, the displayer will not try fast-forwarding to it, it will rather wait for the next closest interval when the next page can start, increasing the current page's duration. When this increase is more than 5 seconds, an icon is displayed in the bottom right corner. 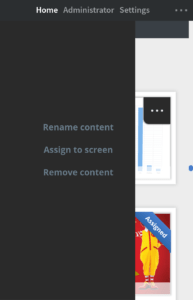 Widgets also have a similar loop defined by the order in the list of slides created in the editor, but they are not limited to only changing the duration of their slides, they can skip slides if necessary, to show their determined slide as soon as possible. The duration of the elements is synced at each time they are swapped, this way if any unexpected delay occurs from any source, like slow network, big file load times, or lag, it naturally gets corrected at each step. There is a minimum time defined for each element type, if the calculated run time for a given element is smaller than the minimum time while syncing, that stage of the element will be skipped, and the next stage will be displayed, for a bit longer time than what was defined, as much longer as was calculated for the previous stage. The minimum time for pages is 3 seconds, for video gallery and contents widget it's 1.8 seconds, for carousel it's 0.6 seconds, for image gallery and weather widget it's 2 seconds, for video and common widget animations it's 1 second, and if the displayer detects a constant slow display where too much skipping occurs, it can increase the minimum time. When video and video galleries have active sync, they will not only sync the start of their stages, they will also modify the progress of their displayed video every few seconds if it's necessary, but only if a certain minimum threshold reached, currently 1 second, to avoid small corrections breaking the continuity of the video. If the calculated timestamp is before or after the interval allocated for the video, it will pause the video on the first or last of it's frames, and play it only when the interval starts. 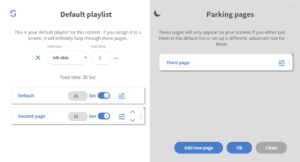 The absolute minimum duration for a page that can be set in the playlist editor is 3 seconds, which is the minimum duration the page is fully visible, without animations. If you add animations to your page swaps, they will not increase the runtime of your pages, the animations will be played during the time allocated for the given page, so depending on the animation type the duration while the pages are fully visible will somewhat decrease. The playlist editor doesn't validate for cases where the duration of the page being fully visible would decrease below the minimum threshold, so in these cases the page duration is increased to achieve the minimum fully visible page duration is met. For example if you set a page to be 3 seconds long, and also set an animation with 1 second duration, the full page length will be increased to 5 seconds, where the animation will be played for 1 second, then the page displayed for 3 seconds, then the animation will be played for 1 second in reversed direction. you can also find the Navigation Menus here. 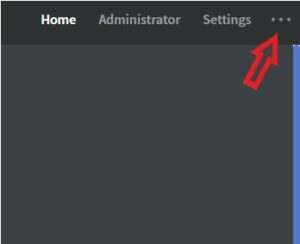 In the top left corner you can find the settings to your account. See more about: User Settings. In the top right corner you can find the Navigation Menu. At the top half of the screen you can manage your Screens and Groups. You can create groups, you can even create groups inside of other groups. to all the screens inside of the group. 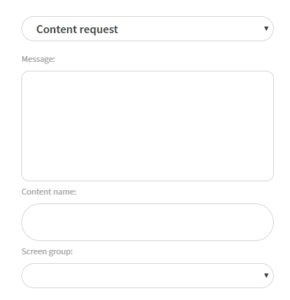 On the other half of the screen you can manage your Contents or request one. You can create a content or request one by click the plus button. See more about: Requesting Contents. You can search, import or request a content with these buttons. You can also download your statistics here. 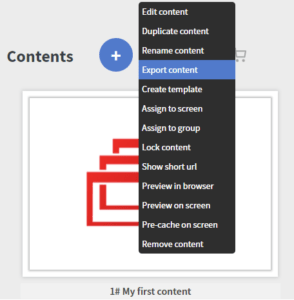 You can back up your content by right-clicking on the content and hitting Export Content. This will create an arhived folder on your pc, that you can import into your system later. On the Settings Screen you can see your Customer Infos, manage your User Settings and Messages. Here you can manage and add new Users. How to use our editor. This is your main area of the editor. In the center of this area you can find your canvas. reload datasources, save your content and preview it in the browser. 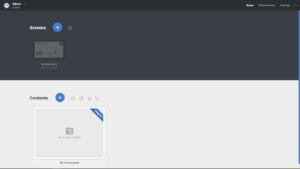 In the top-right corner you can manage your pages. See more about: Pages. 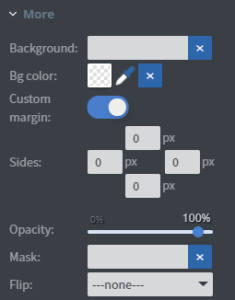 On the right side you can manage your layers. See more about: Layers. On the left side of the page you can find your toolbars. 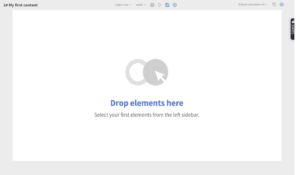 You can drag and drop elements from the Elements Menu. 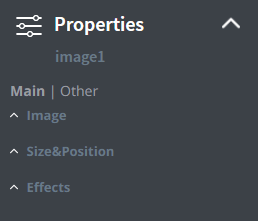 You can edit your elements in the Properties Menu. You can edit your page in the Page menu. With pages you can make multiple canvases. You can find the pages drop down menu in the top right corner of your canvas. 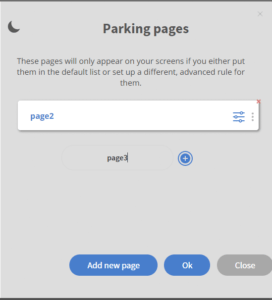 In this menu you can edit your pages, or make a new one. to be abel to display them. After that you can edit the page, and set the lenght of it. See more about Page Lenght. With the set time zone function you can set the time to a different time zone on your devices. You can only use this function if you have the automatic time zone enabled on your device! and selecting Set time under the Managing screen menu. 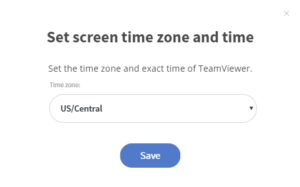 You can select the time zone that you want to use on the device from the list given. You can find the Layers Window in the top-right corner of the canvas. You can manage your layers individually. You can rename, toggle helper lines, show / hide and lock / unlock your elements. You can set the order of your pages in the Dynamic Pages Menu. You can select the page you want to display after the current one. You can set the orders of the pages in the playlist menu by dragging them. This window will pop up when you have multiple pages. Here you can see the order of the pages. and the Green arrows indicates interactive event based transformation. 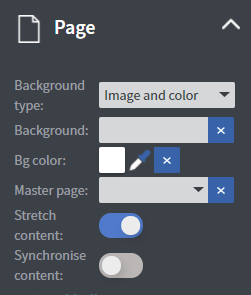 In the Main Pages menu you can set the background of your page. See more about: Page Background.You can set a page to be your master page. You can also stretch and synchronise your content here. 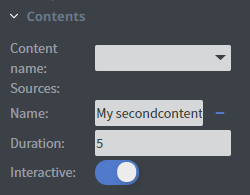 In the Data Binding Menu you can connect a datasource to your content. See more about: Data Binding. 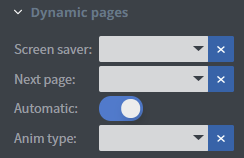 In the Dynamic Pages Menu you can You can set a screen saver. and turn on and off the automatic display function. You can also select an animation type here. In the Button Events Menu you can Enable and Disable the button events. You can also select the target element here. In the Comment Menu you can leave a monitor control commands for the screens. In the Receiver Menu you can set a receiver e-mail to receive the collected data from interactive elements. And other main settings, such as: Size & Position, Font and more. and the More Menu where you can find even further options. You can restore your lost content if you have a back up of it by importing the (.zip) file. See more about: Backing up your content. each time when you are done with creating or editing one. 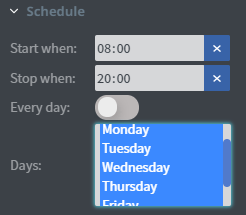 You can find the schedule setting in the Page Settings Menu. Your default page will be the one always being displayed. You can set when to start and stop displaying your page. or display it every day. on weekdays from 8:00am untill 8:00pm. We support many browsers such as: Chrome, Edge, Firefox and Safari. But we are using new technologies, old browsers may not support them sometimes. Templates are available for every user. You can find your templates in the Administrator / Templates Menu. You can create, remove and edit your templates. You can also export and import templates. The e-mailing feature can be enabled or disabled. We highly recommend it to be enabled. First of all, all the user feedbacks are received through this SMTP mail server. On the other hand, it sends us daily statistics about how our system runs, which data can we analyse and make our system more stable and up to date for the market's needs. We need the SMTP host domain. The port of the SMTP server. Whether the server uses TLS protocol or not. The password connected to the username. A From e-mail, which will be displayed on the outgoing letters. A To e-mail address, where the feedback arrive. A copycat e-mail adress (if needed). 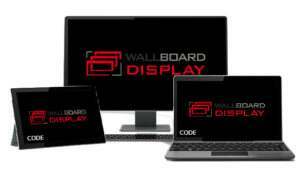 If you want instructions how to install our system on your server or want us to set it up for you, please make contact with us on: support@wallboard.info. Gather the images you want to upload. Rename them to be easily searched for keywords. Copy them on your server to your storage/template folder. Preferably it is the /home/wallboard-storage/template directory. If the templates folder does not exist make the directory. Download the fileList.json generator from here. Unzip the generator and move it to the template folder. Run the generator.sh bash script. It will create a fileList.json file. 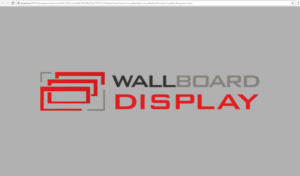 Notify us in an e-mail at support@wallboard.info to point from our domain to your server the Template gallery's source. and the data generated will be automatically refreshed on your displays. You can use an XML file to create a database in our online editor interface. We recommend to install Ubuntu 16.04 LTS, because it has huge support and we use it as well on all of our server, so in order to give you a full, reliable support we need you to use this server operating system. However, on any other linux server os should run our system where Apache, Tomcat, MySQL can run. 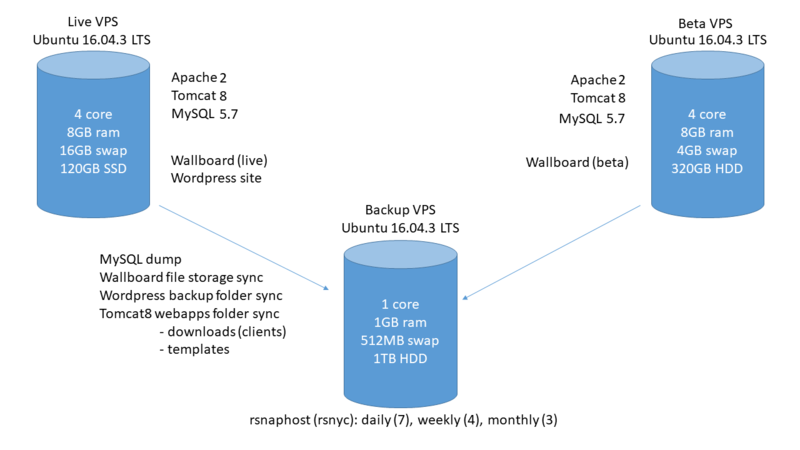 If Apache2, Tomcat 8 or MySQL are installed, please remove them. We would like to start the installation of the server with a clean slate and configure everything from the start on our own way. We need to have root access on the server and the login for MySQL. A domain name (optional). You can use only the ip address if you would like. The storage path where you want us to place the database. A locally hosted VPS that we have access for. Google Analytics for your own use to see statistics and other reports what happens in the system. Have backup from the server in case something goes wrong. Have SSDs installed in raid. 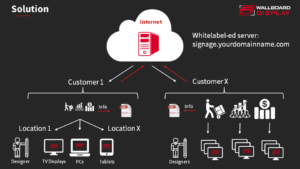 If you want us to white label your server, click here for more information about White Labeling. If you have questions or want to have more information about our server, click here for the Server Setup section. You can browse thousands of images from the Template Gallery. You can search by name and filter by size. Our Windows client displays the content on a windows 10 device. We support only Window 10 mainly because compatibility and security issues. Our windows client can run on windows tablets, computers etc. You can download our Windows client from the editor interface. See more about: System prerequisites and download. Server Address you want your client to connect to. The next step is to customize the Application Settings. With the Allow auto update function your application will check the updates and update if it is needed every time when the client starts up. other application, so they will not cover it. On the next page you can select a display format to your application. 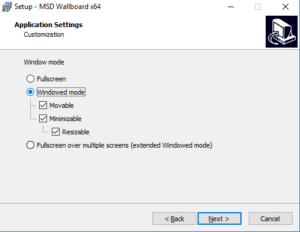 You can also select the Extended windowed mode to display the application over multiple screens. You can also set that if you want your application to be Movable, Minimizable and Resizable. 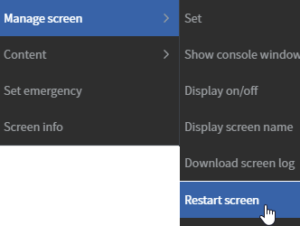 in the last step now you can set the screen resolution. Extended fullscreen mode now you can set the screen orientation. Enable the client to start the client application when the user logs in on the computer. Disable windows update service, so windows update notifications will not pop up. and disable windows bulit-in time sync to make sure windows do not change the time. If you have selected one of the full screen modes, than now you can Lock your device. See more about: Locking Windows device. 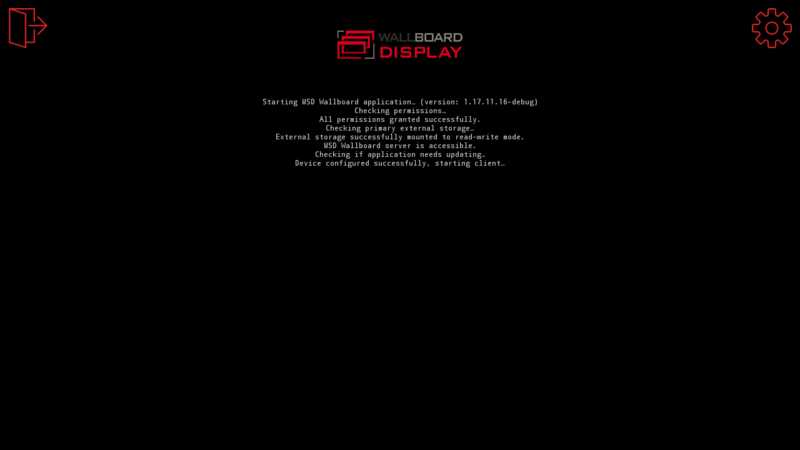 displayed in the buttom-left corner of the screen. 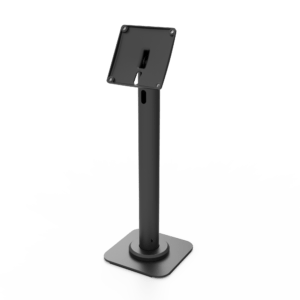 for running as a digital signage device. If you have selected one of the Fullscreen modes, than you can Lock your application. You can enable key filtering which will disable every key combination that is not ours. You can also hide the taskbar and disable the edge gestures (on a touch display). To unlock the Locked device press the "M" "S" "D" keys after each other. That will unlock the device and enable key combinations. with a windows client just like an android. with the Remove Screen function. You can also remove it manually on your computer. the application in a section of your screen. You can make it Movable, Resizable and Minimizable. wich will display the application on the whole screen. 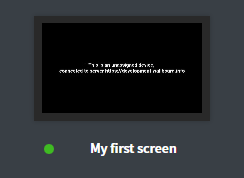 The fullscreen clients can be locked. See more about: Locking down Windows client. 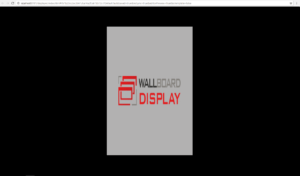 wich will display the application on multiple screens. The extended fullscreen clients can be locked as well. You will also need administrator rights for the windows user. From the download menu in the right upper corner. With the All Element you can collect the data from all of your other interactive elements and send them to an e-mail address. In the Button Menu you can set an image to be your all button. 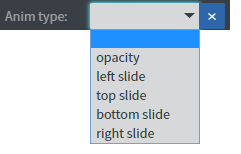 In the Size And Position Menu you can select the width, the height, and the placement of your element quickly. See more specified information about: Size&Position. In the Effects Menu you can select a background image or color to your element. In the Animation Menu you can choose the enter, and the exit animation of your element. See more specified information about: Animation. 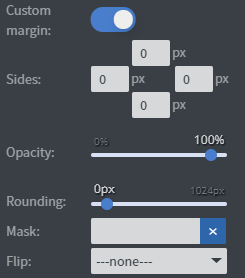 With switching the Custom Margin switch over you can set a custom sized margin to your element. You can set the opacity of your element, or you can mask it. You can also flip your element horizontally, vertically or both ways with the flip function. You can use the Data Picker tool to select your Datasource. In the Behaviour Menu you can set the spacing of your chart. 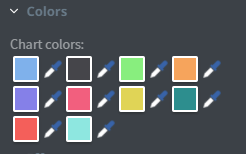 In the Colors Menu you can set the color of the columns individually. In the Labels Menu you can select the font family, size, style of your bar labels on both axis. You can set the text rotation as well to both axis. In the Behaviour Menu you can set the spacing and the depth of your chart. 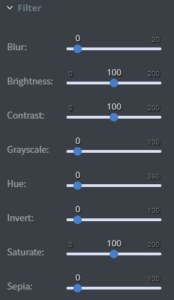 In the Colors Menu you can set the color of the bars individually. In the Labels Menu you can select the font family, size, and style of your bar labels on both axis. You can set the text rotation as well to both axixs. or use a whole folder to display from. In the Behaviour Menu you can set the element to interactive, swipe between pictures on touch screens. You can set the number of pictures shown at once, add a border, set the spacing and the perspective between pictures. You can turn on and off the controls here. You can also set the automatic scrolling time, and upload custom arrows here. In your content you can check none, just one, or multiple check boxes of the same Button Group. In the Button Menu you can set the name of your button group, an unchecked and a checked value. 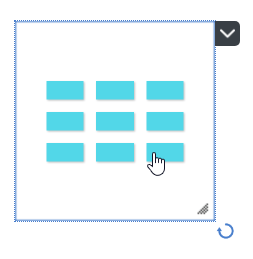 See more about: Interactivity.You can set your element to be checked at the start of your content.You can upload a checked and an unchecked image here.You can also shrink, blur your element and make it grayscaled. In Main Properties Menu you can select your own time zone and the type of clock you want. On the digital clock you can also select from different time formats. 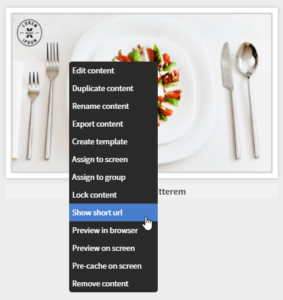 Under Size And Position menu you can select the width, the height, and the placement of your element quickly. On the analog clock you can select from different clock faces, or add your own custom one. 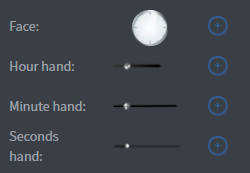 You can also change the clock hands here. On the analog clock in the Font Menu you can set the size, the family, the style, and the color of the font. You can also set letter spacing and shadow to your clock here. See more specified information about: Using font. In the Button Menu you can set your button group. See more about: Interactivity.You can set the position of the displayed data vertically and horizontally. 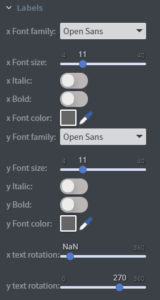 In the Font Menu you can set the size, the family, the style, and the color of the font. You can also set letter spacing and shadow to your element here. In Content Menu you can select the content that you want to display in your main content. 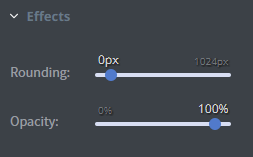 In the Effects Menu you can set the rounding and the opacity of your element. In the Behaviour Menu you can set the page data row. You can also synchronise your content and make it interactive. In the Other Effects Menu you can select a background image or color to your element. the duration time of it and make it interactive here, too. In the Text Menu you can type the text into the field that you want to display in your element. In the Behaviour Menu you can set the animation and the type of it that you want to add to your element. With the Speed Slide you can set the speed of the animation. With the Stagger Slide you can set that how quickly the letters starts after each other. 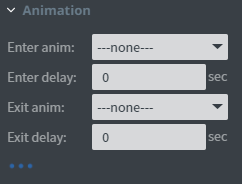 With the Delay Slide you can set the delay time between the animation waves. 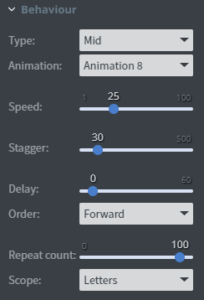 With the Order you can set the starting position of the animation. With the Repeat Count Slide you can set how many times the animation will be repeated for..
or you can set the animation on every/each word. With the custom element you can display a website, or html code. In the Text Menu you can choose your content type. 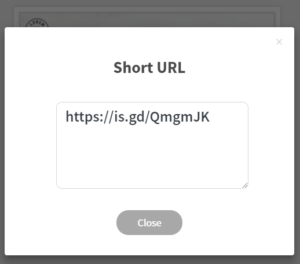 With the URL type you can set the URL that you want to display. You can also make it interactive and display it same as the origin website. you can write it into the text box. You can also make it interactive. You can easily Add and Remove image from your gallery, or you can use a folder. 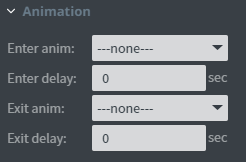 In the Behavior Menu you can set the delay time, and the animation type between the images. With the Stretch Button you can stretch your image to the size of your element. in your content in gauge format. In the Data Menu can use the Data Picker tool to select your Datasource. You can set the starting and the ending angle of your gauge. You can also set a minimum, a maximum value and add a label to your gauge. In the Behaviour Menu you can set a spacing to your gauge. In the Colors Menu you can select the colors of your element individually. In the Content Menu you can insert the URL of your calendar. In the Effets Menu you can set the rounding and the opacity of your element. 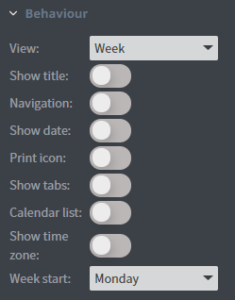 In the Behaviour Menu you can change the view of the calendar to weekly, monthly, or agenda view. the print icon, the tabs, the list, and the time zone here. You can also select the starting day of the week. 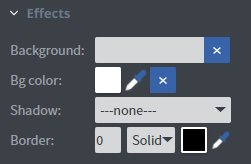 In the Other Effects Menu you can set a background image, or a background color. You can also add a shadow or a border to your element. In the Content Menu you can insert the URL of your google document. 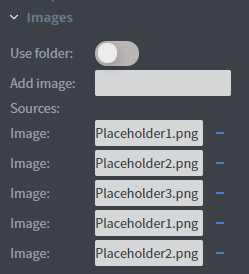 Under the Image Menu you can set the source picture of your element. Under Effects Menu you can change the opacity of your picture or round the corners of it with the rounding function. or add shadow and border to your image. In the filter menu you can fine tune your picture with different type of filters. 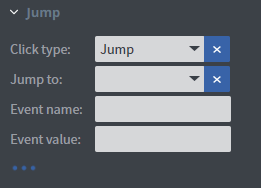 In the Jump Menu you can set up the jump function. See more about the jump function: Jump. In the Buttton Menu you can set your button group and name your event. 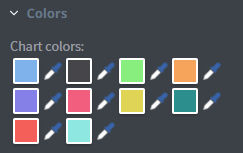 In the Colors Menu you can set the color of the lines individually. In the Behaviour Menu you can set the border size, the style, and the color of your cells. 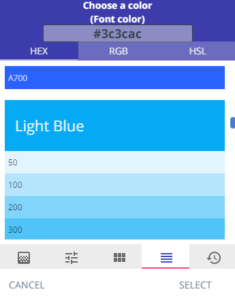 You can also set the header cell color, and the color of the odd and even numbered columns. and than display the value of your data in all kind of ways. In the Behaviour Menu you can set the value directly and the maximum value too without a datasource. If you select the exact value display format you can set a symbol to display next to the value. You can also select the orientation, the background and bar color of your element. In the Behaviour Menu you can set the spacing, the depth, and the size of the symbols. You can choose to display or do not display your legend. You can set the layout, the vertical and the horizontal alignment of the legend. You can also set the font family, size, style and color of the legend. In the Color Menu you can set the color of the pie pieces individually. 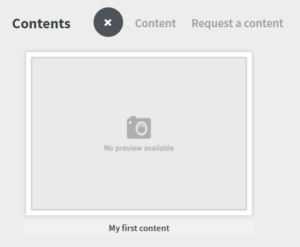 In the Image Menu you can select the image that you want to display in your content. In the Behaviour Menu you can select an animation and the type of it to your element. With the Stagger Slide you can set that the letters how quickly start after each other. You can set the order that the animation will start. 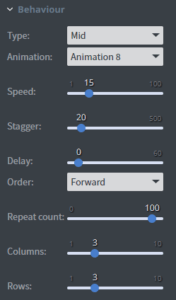 With the Repeat Count Slide you can set how many times will the animation repeat for. You can also set the number of Columns and Rows of your element. You can also round over the corners of your element and set the opacity of it. With the QR code element you can generate your own QR code and add it to your content. You can generate your own QR code by typing the text you want into the Text Field. 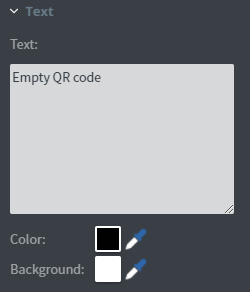 You can also set the color of the QR code and the background color of it. In your content you can only check one radio button of the same Button Group. See more about: Interactivity.You can set your element to be checked at the start of your content.You can upload a checked and an unchecked image here.You can also shrink, blur your element and make it gray scaled. With the Reset Element you can reset your other interactive element's value to basic values in the elements button group. In the Button Menu you can set your button group, and an image to be your reset button. In the Text Menu you can select between three types of outputs. You can select the Simple Text type, and then type your text that you want to display. Or you can select the Message Board type, and display the saved messages. 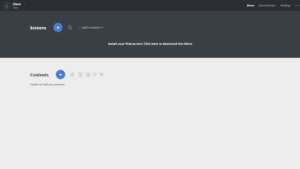 Or you can select the RSS type, and display by a RSS URL. You can also set the speed, the direction, and the trim of your element. You can set a after and before text to display before or after the main text. In the Shape Menu you can change the type of your shape to another one. You can set the width from 3 to 150 pixels of the line of your shape, and the style of it. You can also set the stroke color here, see more about: Using Colors. In the Source Menu you can set the stream to broadcast and the type of it. You can also set the volume here. In the More Menu you can set a background picture or a background color to your element. With the Submit Element you can collect data from one of your other interactive element and send it to an e-mail address. In the Button Menu you can set your button group, and an image to be your submit button. 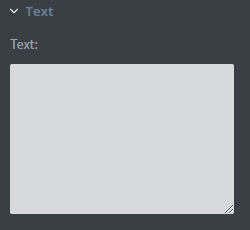 In this Text Box you can type the text that you want to print to the canvas. In Effects Menu you can set menu you can set a background picture or a background color of your text. In the Source Menu you can select the video that you want to display, and set the volume of it. In the Filter Menu you can loop your video, and select the keep ratio to keep the ratio between screen sizes. or you can select a whole folder to play from. In the Behaviour Menu you can set the volume of your video with the slide. With switching the Keep Ratio switch the videos you play will be the same ratio. In the Effects Menu you can add a shadow and a border to your element. You can also set the size, the type, and the color of your border. See more about: Using Color. With the Rounding Slide you can round over the corners of your element. You can also flip your element horizontally, vertically or both ways using the flip function. With the weather element you can display the current weather of a location in your content. by typing their name into the textbox. 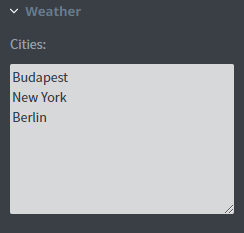 and you can set the animation between displayed cities.You can set the displayed weather icon type with the Icon Set function. You can also turn on/off the icon, the city, and the temper.With unit you can change the displayed temper format. In the Source Menu you can type into the Video ID Field the URL of the video that you want to play. You can loop your video with the Loop Switch. You can also set the volume of your video with the Volume Slide. In the Effects Menu you can round over the corners of your element or change the opacity of it. In the Other Effects Menu you can add a shadow and a border to your element. In the Content Menu you can set the twitter page that you want to display in your content. You can use the URL or the name of the twitter page. In the Behaviour Menu you can set the element's behaviours. With the Latest tweet button you can limit the element to only show the latest tweets. wich changes the element's height dinamicly. You can set the color of the links in the content. You can make the content in your element refresh periodically. And you can also make it interactive (so you can interact with it on touch screens). 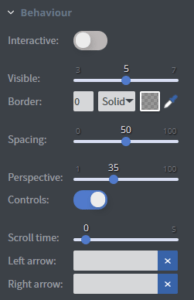 You can show and hide the header, the footer, the border, and the scrollbar. You can also make the element transparent. With the facebook element you can display facebook social pages in your content. In the Content Menu you can set the facebook page that you want to display in your content. You can use the URL, the id or the name of the facebook page. You can choose wich content types you want to display in your content. You can set the header to small or hide the cover image. turn on the console window on the device and look for errors. although it should be active. This issue can be caused if your device is actually inactive or you are looking at two different devices in the system and in real life. Check and make sure that you are looking at the same device that seems to be inactive in the system and make sure it is turned on. Most of the time this issue appears when you don't have internet connection on your device. Check and make sure that the device that seems to be inactive in the system has internet connection. This issue can be caused if your device is actually inactive. Check and make sure that the device that seems to be inactive in the system is turned on. Some android boxes can not handle an Ethernet and a Wi-Fi connection simultaneously. Check and make sure that the device that seems to be inactive has either the Ethernet or Wi-Fi connection at a time. 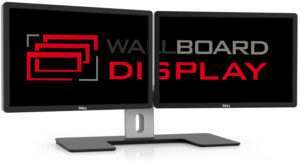 For help, contact us on support@wallboard.info. If you have a question that is not in our Knowledge Base leave it on our Frequently Asked Questions page. The animations and the moving elements in the content don't move smoothly. 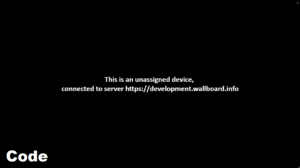 This issue can appear when you have to many animations, videos, and moving elements in your content and the device's performance is not enough. Try to use lower quality images, videos and fewer animations. You can also upgrade your device to a better one. It also can be caused if there is not enough RAM memory left on your device. Try to clear the cache, reconnect the device to the editor interface and reassign the content. When you have a device and a content assigned to it. You change something in the content but the device is still playing the old version of it. Sometimes, especially when you have dozens of contents it happens that you have the wrong content assigned to your device, or you edited a copy of the content. try to assign it manually again. Refresh the content by right clicking on the device and selecting the Refresh content option. 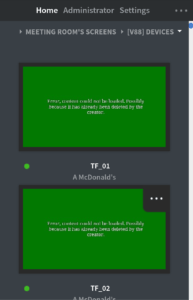 This issue can also appear when you don't have internet connection on the device, and it can't reach the server. Also when you have slow internet connection it can take some time to download the new version of the content to the device. Check the internet connection on your device. 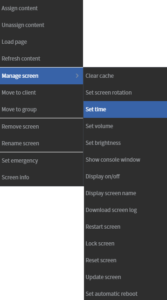 by right clicking on the device and selecting the Clear cache option, reconnect it to the editor interface and assign the content again. There are some cases when the devices seems to be online but the user can not log in. An admin set your account to restricted, which basically means that your account is inactive. Contact us or one of our administrators to investigate the problem. Sometimes password managers can alter the password that you save and on the next log in the password you type in will not be correct. Contact us or one of our administrators to help investigate the problem and reset your password. An admin may deleted your account. 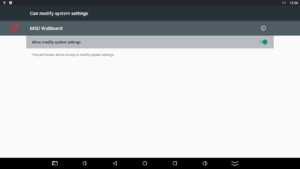 The client software did not start automatically, and the default android launcher shows up. or the device is locked down which automatically sets the app for default homescreen application. Let's reboot the screen from the Content Editor and see if it works after reboot or it is still a problem. If it starts then there is an issue on our side or the android device's version is different that we are using and we may not have it compatible yet. In this case please report the problem to us for further investigation. but it does not start or it starts but crashes. 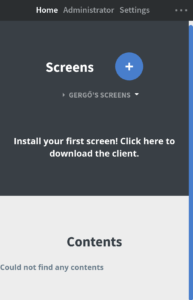 You can download the screen's log. In the log you can search for the words 'warn' and 'error', which can lead to expose the problem really fast. In this case you may also have to contact us for investigation. 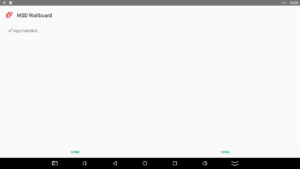 log, client version, android version, the type of the device.